With the 53rd edition of the Superbowl being played on Sunday 3rd February 2019, which is just a couple of days away, we will see a familiar team in the New England Patriots as they take on the Los Angeles Rams in the Mercedes Benz Stadium of Atlanta. The game will be aired on CBS, make sure you have the right access as discussed on their website. The referee of the game will be the 54 year old John Parry. With the Patriots favorites for many online sports betting websites, we will give you a rundown of how the season fared for these two franchises. With this being the 49th Patriots season in the NFL, they agonizingly lost the last superbowl in the hands of the Philadelphia Eagles. After three wins from four during pre-season, including a win against the Philadelphia Eagles, the Patriots started the season with just 1 win from 3 games. That win came against Houston Texans who successfully qualified for the final play-offs. Form easily picked up with 6 consecutive victories before they were eventually beaten by the Tennessee Titans, who missed out on the Wild Card Playoffs by fine margins. After wins against New York Jets and Minnesota Vikings, the last year finalists lost two a row against Miami Dolphins and Pittsburgh Steelers. New England Patriots finished the season strongly with wins against Buffalo Bills and New York Jets to take them to the divisional playoffs as first place in the division with 4 wins difference dividing them and the Miami Dolphins. In the conference, the 11 wins from 16 games were enough to see the second place in the conference and set an exciting divisional playoff against the wild card qualifier Los Angeles Chargers. In a summary the New England Patriots won 11 games, lost 5 which obviously tied 0 games and a winning percentage of 688. 5 games of those 11 games won were against divisional rivals and lost only 1. Leading to have a record of winning 8 games from 12 against conference rivals. The strength of Schedule and Victory were 482 and 494 respectively. The season saw the Patriots end it with 2 consecutive victories. Just like the 2017 season, the 2018 season saw the Patriots finish 1st place in the division, however, with 13 wins and finished first in the conference. The Divisional playoff played against Los Angeles Chargers was won by a margin of 41-28 in the Gillette Stadium. Which was an improvement in opposition as in 2018 they won 35-14 against Tennesse Titans in the same stadium. On the 20th January 2019, Los Angeles Patriots won the AFC Championship for the second year running against the first placed conference franchise, Kansas City Chiefs with small margins of 37-31 in overtime after finishing the game deadlocked at the normal time but thanks to a touch down from Burkhead, the Patriots will be playing next Sunday. In 2018, the Patriots were also made to force through to win 24-20 against Jacksonville Jaguars before eventually losing the Superbowl. The Rams had a so and so preseason as they won 2 out of 4 preseason games. However, their form picked up at the right time as they started the season with 8 consecutive victories. Followed with a disappointing defeat to the New Orleans Franchise, New Orleans Saints. 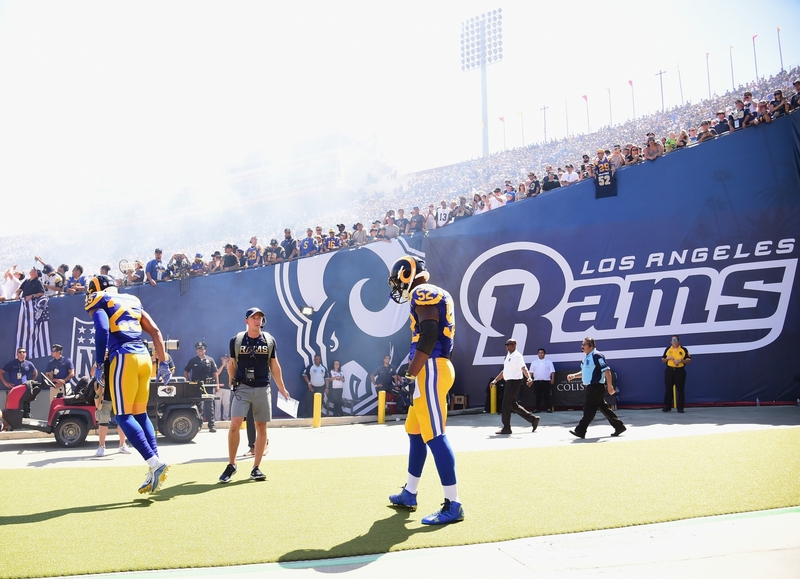 Los Angeles Rams came back from the disappointing by winning 3 consecutive victories against the Seattle Seahawks, Kansas City Chiefs, and Detroit Lions respectively. Before losing to the Chicago Bears and Superbowl holders Philadelphia Eagles. Just like the Patriots though the Rams finished the season with two consecutive victories against Arizona Cardinals and San Francisco 49ers. 13 wins were enough to see the Rams through as first place in the division and finish second in the divisional playoff. It was not easy as the Seattle Seahawks only lost 3 more games, in fact, they qualified as wild cards with ease. In a nutshell, the Rams won 13 games from 16 and came to second place due to losing to the first placed team New Orleans Saint who had the same record. Tied 0 games since they lost the remaining games. They ended the season with 2 winning streaks and ended with a percentage of 813. While winning all the division games, the Los Angeles Rams lost 3 games from 12 against conference rivals. The strength of Schedule and Victory was 480 and 428 respectively. This season was an improvement as they got the divisional playoffs automatically rather than risking to play a wild-card playoff which they lost in 2018 against Atlanta Falcons in the Los Angeles Memorial Coliseum. This season also saw the Rams winning two more matches than last season. After the heartache of losing the wild card playoff last year, the Los Angeles Rams won their divisional playoff against Dallas Cowboys who qualified through first place but had to win a wild-card playoff before. The result was 30-22 which showed the class of both teams. The NFC Championship was won by beating the only team better than them in the conference, New Orleans Saints. In the end, it was worth it for them to lose against them in the division as they took the championship out of their grasps in Overtime thanks to a result of 26-23 and a Field goal by Zuerlein in the Mercedes-Benz Superdome. This set up an exciting Superbowl against the New England Patriots. If you would like to know more about the odds and updates about the final than look at our updated article about the 53rd Edition of Superbowl. For the best odds for Superbowl look nowhere else than Bovada, a legal website for Americans and regulated by the Kahnawake Gaming Commission to bet on. Bovada also has exclusive website offers and promotions to newcomers. Bovada takes Visa, MasterCard, AmericanExpress, Bitcoin and Bitcoin Cash as payment. We hope this article helps you and let us know if you have any suggestions. Check our article about the NBA 2018-2019 season to increase your chances for larger winnings.